Just Capitalism is a Christian moral defense of economic globalization as a system that is well- suited to provide the necessary material needs that are prerequisite for human community and flourishing. Global-based market exchange offers the development and distribution of the goods of creation for humans to enjoy and share. Globalization also offers "the most realistic and promising way of exercising a preferential option for the poor." Waters argues that economic globalization, and thus capitalism, is a necessary condition for sustaining human life but not a sufficient condition for enabling human flourishing. Even though globalization is generally compatible with Christian theological and moral claims and can realistically facilitate the well-being of the human family, it must be reoriented toward koinonia—human community, communication, fellowship—as the global economy's primary goal in order to help actualize human flourishing. 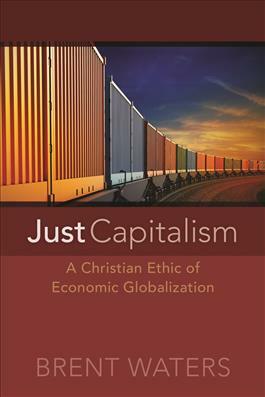 Readers will gain insight about how economic globalization (and thus capitalism) is good for the human family and can be made better by certain reorientations that are compatible with Christian moral values. Waters provides a mature and civil counterargument against knee-jerk condemnations of economic globalization and capitalism. "Hallelujah! A theologian who understands economics! Brent Waters's work on the intersection of theology and economics will likely annoy his friends on both the left and the right, which suggests to me that he has nuanced this discussion properly. He recognizes that the vast differences between the zero-sum economy in biblical times and the dynamic market economies of today make a very big difference in the way we ought to read the Bible and understand Christian tradition on economic matters. Waters keeps us from a simplistic reading of the Bible, yet he recognizes that there are serious issues with globalization and that Christian moral theology has something relevant to contribute. He openly defends the goods produced by affluence while at the same time affirming that affluence is a means and not an end in itself. His thesis that markets and exchange (set in the proper regulatory and political structure) are necessary but not sufficient for human flourishing opens the door to the important place for civil society—namely, the church—to round out what is necessary for full human flourishing this side of eternity." "Brent Waters has written a book about global capitalism with which almost every reader will find some reason to disagree—and that is exactly what makes it significant and well worth reading. Central to his theological analysis of both the necessity and the insufficiency of global capitalism is a Christian concept of `communication' that is neither market exchange nor governmental coercion. He argues that a global economy shaped with that in mind offers the most promising way to take seriously in our world a preferential option for the poor. This is a thoughtful and thought-provoking book." "This is a book I've been waiting for: a careful, nuanced, but bold argument for the good of markets that neither demonizes them nor idolizes them. In other words, I no longer have to wait for Oliver O'Donovan to write a book on economics: Brent Waters did it instead. If you care about the poor, he argues with a contrarian flair, then you should affirm globalization. And if you care about capitalism, he adds, you should want to tame it. With verve—and just the right amount of acerbic wit—Waters articulates a theological defense of capitalism that will challenge deeply held assumptions on both left and right. I'll be pressing this into the hands of a lot of my friends, and even more opponents."